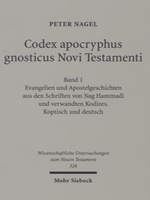 This volume contains the Coptic texts and parallel German translations of nine Coptic-Gnostic and Coptic-Manichaean Gospels and Acts of the Apostles from Nag Hammadi, the Berlin Gnostic Codex 8502 and from the recently discovered Codex Tchacos. It presents a detailed introduction to each text, describing its background, origin and literary forms. The Coptic texts are accompanied by a critical apparatus, based on the examination of facsimiles or the manuscripts themselves, and the previous editions. The translations are supplemented by explanatory notes or comments. The volume is completed by indices of proper names and biblical quotations. Included are the Gospels according to Mary, Thomas and Philip, the Gospel of Truth and the Gospel of Judas as well as two Acts of Peter.